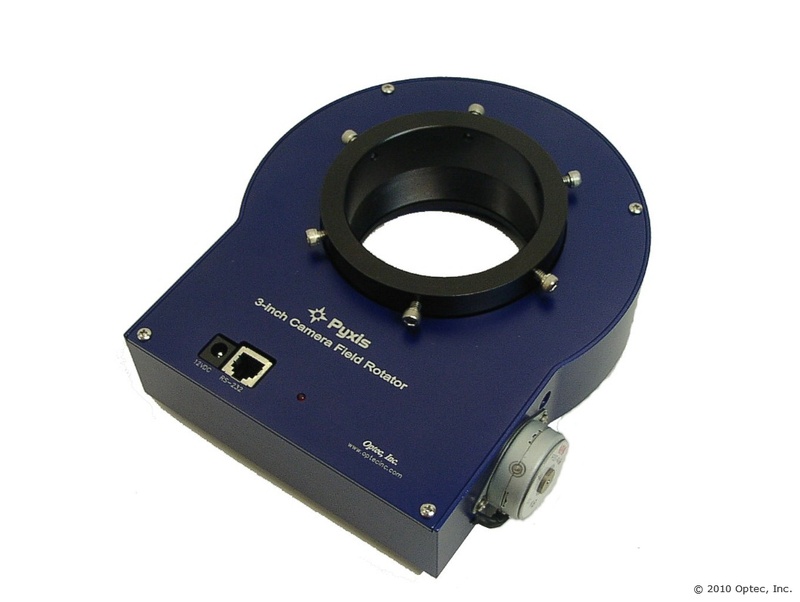 The Pyxis 3-inch has a full 3 inches of clear aperture and is designed to hold large instrument packages without flexure or wobble. A 6-inch bronze worm gear and stainless worm rotate the center tube with a resolution of 0.01875 degree per step from the stepper motor. The operating software is very similar to the smaller Pyxis so that existing third party software is compatible. 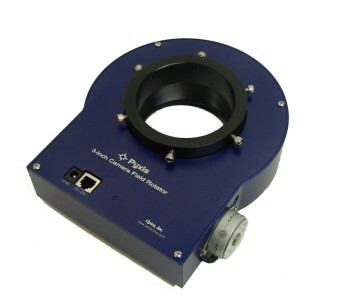 De-rotation of the field for long exposure images with alt-azimuth mounted telescope and rotation of the guide chip for SBIG camera to a suitable bright guide star are the two primary uses of this instrument. Power requirements and other operating conditions are similar to the 2-inch Pyxis model. 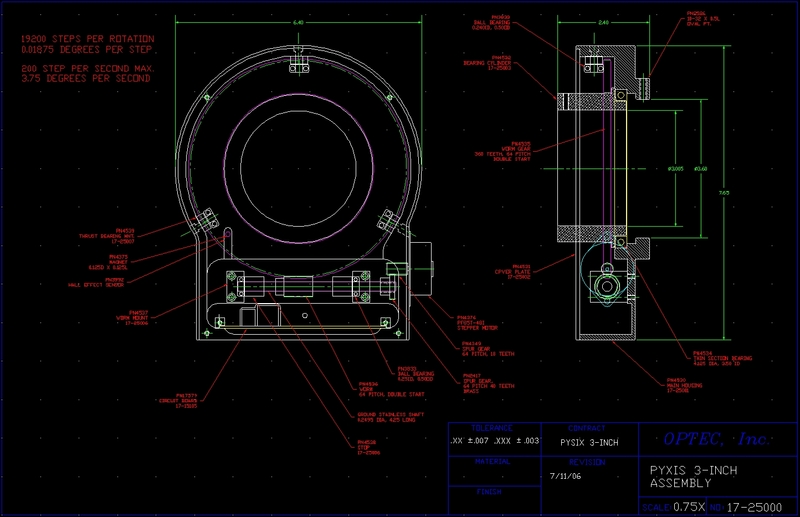 This model is large and heavy and is intended for larger telescopes on observatory caliber mountings. The 2.4-inch thickness warrants telescopes that can accommodate this increase in the back-focus distance. It uses the same telescope mounts and camera side adapters as the TCF-S3 - Optec's new 3-inch temperature compensating focuser. Any telescope mount or camera side adapter has to be ordered separately. 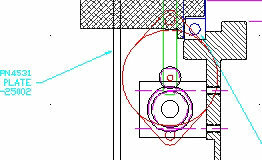 Cross-sectional view of the Pyxis 3-inch. Click here for a pdf version. Like the 2-inch Pyxis model, the unit can only be controlled by a PC computer running the Optec PYXIS.exe control software or third party compatible software. Manual control is not possible. A flat wire serial cable is available for connection to a standard RS-232 interface COM port at 19.2K baud. Standard lengths and custom lengths up to 100 feet are possible. Cables and COM port adapters need to be ordered separately. A 15 VDC regulated power supply is included with a right angle 2.5 mm power jack. Stepping up to 15 volts DC provides about 20% more torque without sacrificing speed. Contact Optec to upgrade to the 15 VDC right angle power supply for your existing Pyxis 3-inch. More information and specifications are available in the Pyxis manual.